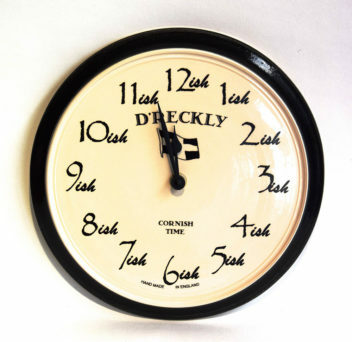 Home / Cornish Gifts / Gifts for the home / DRECKLY CLOCKS CORNISH TIME! The original hand thrown porcelain Dreckly Clocks! You will never be late again with Cornish Time!! Approx 9″ Diameter in size. Available in Black,Blue,Green and No Colour Band. No clocks exactly the same!